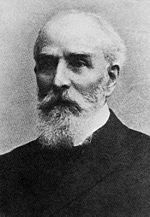 Wilhelm Kress (* July 29, 1836 in Saint Petersburg; † February 24, 1913 in Vienna) was a pioneer in aviations and constructor of aircraft. Kress came to Vienna in 1873, where he developed the first modern delta-flying hang glider in 1877. This hang-glider was a major achievement for the time, where many engineers still struggled with "heavier than air"-developments of non-motorised airvehicles. During the turn of the century he was one of the world-wide contestors for break-through motor aircraft. In 1900 he developed the stick control for aircraft but did not apply for a patent. (Instead, a patent was awarded to the French aviator, Robert Esnault-Pelterie who applied for it in 1907.) Kress' aircraft, the Drachenflieger, was constructed for water takeoff and made a first successful attempt (it was not a controlled flight like the one of the Wright brothers in 1903, but more or less larger 'hops') in 1901 at the Wienerwaldsee near Vienna. A controlled longer flight was not possible because the engine (made by Daimler) was twice as heavy as Kress had specified in his order, and could be operated only at half of its nominal power output. During one of his attempts at flight taking off from water, his plane was destroyed when it became entangled on debris floating in the lake.